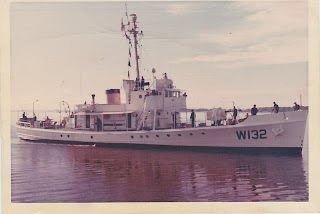 Of all the stories and stuff I write about, none has generated such affection and comment, as the posts concerning the old USCG Cutter Cartigan, which sat in Sheepshead Bay for many years when I was growing up in Brooklyn,N.Y. The following is a story of life aboard the vessel on patrol in the Gulf of Mexico. The photo is of the author in 1966 or '67. I haven't changed a word, just cut and pasted the story straight from the e-mail by Mr. George Dobos,who served aboard her and has promised some more stories, which I will be only too happy to print here. I have attached several fotos that I hope you enjoy. The painting of the two "buck n' a quarters" I got from a calendar somewhere. It is one of my favorite pictures. The bridge was all polished up for inspection. The young skinny guy sitting in the radio shack is yours truly circa 1966 or '67. The last one is the Cartigan taken off the St. Andrew's Marina in 1967 before she got her "racing stripe." The time that I was in, 1964 - 1968 was a bad time for the Coast Guard. All the cutters were aging or had aged already. The larger cutters, 311' & 327', were WWII or before commissions and some were actually old Navy vessels that the Guard got from them. These were very lean years. The modernization of the fleet began in late 1967/68 with the building of 210 ft cutters. As radiomen, we used morse code for commucations over 95% of the time. The main transmitter in the radio shack (the black box next to me in the foto) was an Army model 1944 that had vacuum tubes as big as a football. When it went out, we went to the shipyard here in Panama City and bought one just like it off of an old Liberty Ship that they were going to cut up for scrap. As a side line, Panama City's shipyard made Liberty ships during the war and they came back full circle to be cut up. My duties as a Radioman differed depending on my rank at the time. As a RM3, during any maneuvering drills, i.e. general quarters, man overboard, etc., my station was working the engine order telegraph. 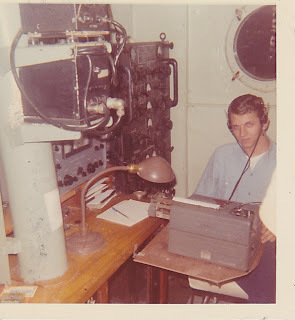 When I made RM2, my billet was sound powered talker on the bridge relaying all communications to and from the bridge to all stations on the ship. There were only three RM's on the ship. Having given you a little background, here comes the first sea story. We were on Campeche Patrol in the southern Gulf of Mexico. 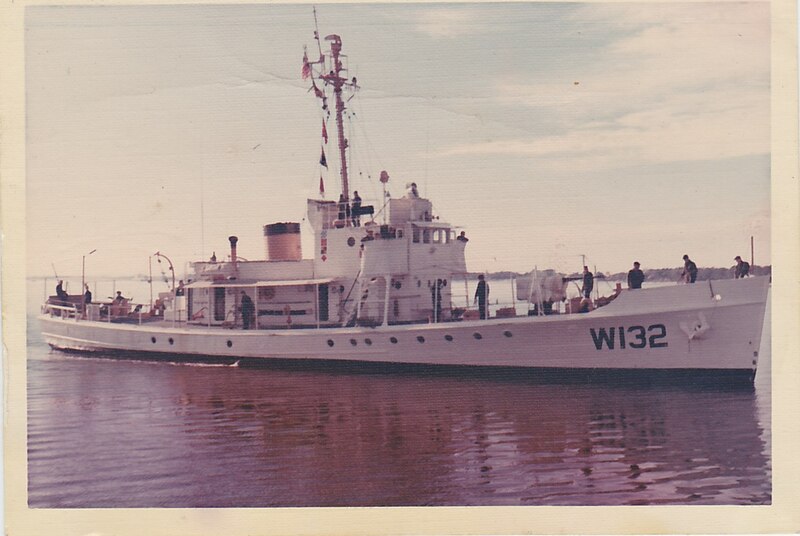 Our CW call sign went from NRLF to NUZY (or in English, CGC Cartigan to Campeche Patrol Vessel). The seas were flat calm, not a ripple or a wave to be seen and it was hot. Did I mention that the airconditioner only worked in the winter time? Anyway, we came across this very large tree branch shaped like a slingshot. It was clearly a menace to navigation. After much deliberation, the Captain decided that we would maneuver into the crotch of the tree, hook a line to it and manually chop it up! He sent the lowest rated seaman down onto the log with an axe. After a couple of whacks, and nothing was happening, he opted to send the XO down to see if he could do any better. The XO had irritated him because while he was trying to get this log cut up, the XO was fishing off the fantail for dolphin. Anyway, on the first swing, the XO cut his safety line and almost fell into the water. Time for a new plan. The Captain contacted District HQ in New Orleans and got permission to destroy the heinous object using our 40mm, 1944 Army single barrel deck gun. We issued a notice to mariners as to what we were doing and then went to General Quarters. After backing off a safe distance, the order to fire was given. Slow fire. After coming nowhere near the target, the Captain ordered rapid fire. As the gun fired, the ship recoiled to the port and started rolling to the starboard, the gunners firing the entire time. Here's where it gets interesting. As they were firing, they were walking the shells back towards the ship and instead of hitting the target, they were coming closer to hitting ourselves. Needless to say, the Capt. ordered a cease fire because we weren't doing any good. We ended up taking a broom stick, putting a lifevest light on it and tacking it to the log. We chartered its path and issued another Notice to Mariners and let it go on its way. More stories to follow later. USCG Cartigan mistakenly fired upon the US submarine R-2 on 25 August 1942 in a case of "friendly fire." Anyone know anything about that incident?